We all have those few programs we can't do without. For the non-technical user, the list might include Internet Explorer and Outlook Express. For the hard-core geek, it might be Vim/Emacs, GCC, and GDB. As for me, lately I've found that VMware is way up on that list. This is particularly the case when it comes to testing and evaluating software. If it's anything even remotely "big," such as Microsoft Office, or if it's something I'm doing for work or casual research and am not planning to keep installed, I'll just break out a VM, install the software, and then blow the VM away when I'm done. In fact, I keep a directory full of compressed VM images of various pre-configured test setups for just this purpose. When I need to try something out, I decompress one of the images, do my thing, and then delete it when I'm all done. It's kind of like the old-fashioned "take a disk image" approach, only way, way faster. Honestly, VMware makes things so easy, it baffles me that people still bother with physical test machines for testing applications. It's so...1990's. But VMware is great for regular work too. The performance is quite good, so if you have even a middle of the road system, you can run medium to heavy-wieght applications in a VM without too much pain. This is especially useful if you happen to be stuck running Windows, because some things are just so much easier to do in Linux, such as getting the tools you need. Of course, virtualization can't beat running natively, but flipping back and forth between your regular desktop and a VM is a lot less cumbersome than dual-booting or having two computers. Of course, my whole-hearted adoption of virtualization is not without its price. This week I found myself looking up prices on new RAM sticks for my desktop and laptop. The main benefit I envisioned? I could comfortably run more than one instance of VMware! It's the perfect answer to, "What could you possibly do with 4GB of memory?" If you've never used any virtualization software, you really need to check it out. It's a godsend. 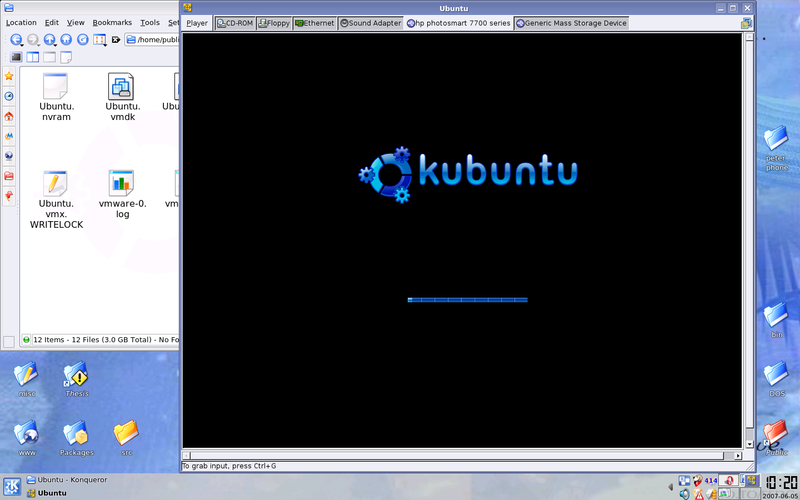 I use VMware Player because it's free and available on both Windows and Linux. QEMU is also a fairly nice cross-platform solution. And for the Windows-only crowd, there's always Virtual PC. They might take a little getting used to, but it's well worth the effort. Enter the product of 36 and 47.